Manhattan, NY Owner and operator Cove Property Group and owner Bentall Kennedy, working with Montroy DeMarco Architecture LLP (MDALLP), have completed the redevelopment of 101 Greenwich St. (formerly Two Rector St.), a 26-story, 481,000 s/f office building in the Financial District. 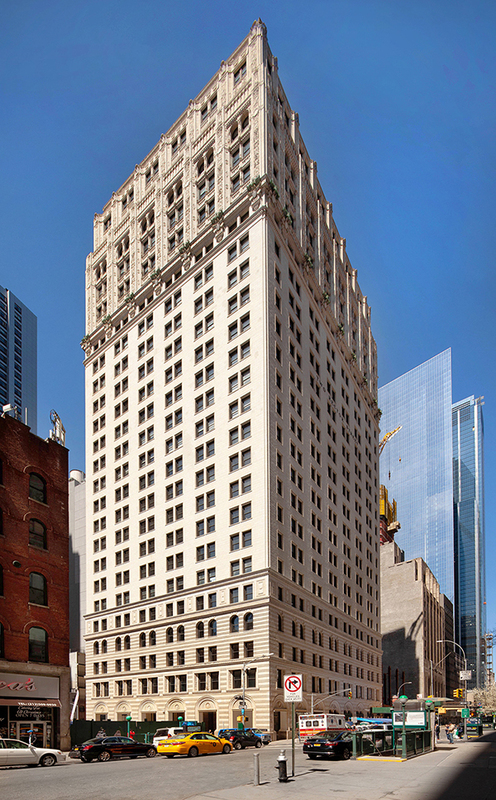 MDALLP worked with the Beaux Arts building’s owners to reposition the property from a class B to a class A office tower through architectural and infrastructure upgrades. Of the $75 million construction budget for the redevelopment of the 111-year-old building, 75% of it went toward technology and mechanical, electrical, and plumbing (MEP) upgrades, while the rest went toward the lobby upgrades, refreshed common areas, and new elevators. The property was redesigned to achieve a LEED Silver rating. 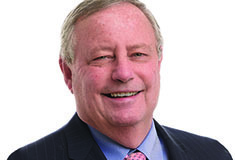 Richard DeMarco, AIA, MDALLP’s principal in charge of the design for the repositioning, noted that Cove and its partners were interested in attracting Technology, Advertising, Media, and Information (TAMI) industries tenants, as well as those from the financial and hospitality industries. “TAMI tenants – and, increasingly, more progressive tenants in other market segments – are demanding a different kind of office space. They want well-lit spaces with expansive open-plan areas and fewer private offices. The floor’s best views, for example, are now used for communal areas rather than executive offices,” DeMarco said. The tower is situated west of the Trinity churchyard between Greenwich St. and Trinity Place. It is also close to the “Oculus” – the WTC Transportation Hub – and its accompanying retail mall, Westfield WTC, as well as Wall St. Since the building’s acquisition by the new owners, the area has been changing rapidly. There are a total of four new buildings going up within just a one-block radius. One is a hotel, and the other three are commercial and residential buildings. As for the success of the repositioning of 101 Greenwich itself, there is already a high level of interest from new tenants. This represents the success of the owners’ shift in targeted tenants’ industries as well as the recent changes in “corporate demographics” in the area. One of the building’s new tenants is Convene, the meeting and co-working space provider. The company is relocating their headquarters to 101 Greenwich, after searching for what they consider to be a ‘best-in-class experience. This is Convene’s 11th New York City location, and the one of its largest nationwide at 58,000 s/f. The company took the entire second, third, and fourth floors – as well as 2,300 s/f in the lobby – in an effort to partner with Cove to provide amenities to all of the building’s tenants and outside clients. Specifically, the second floor features meeting spaces and a kitchen, while the third and rest of the fourth floors house conferencing and work suites. Tenants and outside companies will be able to rent these facilities on demand. In addition, Convene has taken 2,300 s/f of the ground-floor lobby to create a high-end, microbrew coffee shop that will be run by For Five Coffee Roasters. Overall, Convene will curate a variety of in-building programming to foster community among the various tenants. Tenants may order catered food from the second-floor kitchen or from the lobby café via a proprietary mobile app that will also enable them to engage with the various programming offered. In addition to MDALLP, the project team included The Sweet Construction Group, which served as the construction manager during the upgrades. Sweet also provided preconstruction services prior to the start of construction, creating budgets for various options while negotiations were taking place. Other project team members were mechanical, plumbing, and electrical (MEP) engineer MG Engineering and lighting consultant zeroLUX. Winick Realty Group LLC is the retail broker and JLL is the commercial broker and building manager. Early on in the course of the negotiations to purchase the building, Cove and its partners had the foresight to put together a group of consultants – fronted by MDALLP – to analyze the property in order to plan for upgrades and, ultimately, repositioning. Having the architectural, engineering, design, and brokerage partners on the team prior to closing on the building was instrumental to the success of the repositioning. It allowed the ownership to create a complete plan for redevelopment during the underwriting phase and start the work the second the deal closed. Not only is the building’s location and floor layout attractive to TAMI and other progressive tenants, the very character of the building is appealing to them, as well, since it is decidedly not a generic glass “box.” The structure, designed by Clinton and Russell, was built between 1905 and 1907 for the United States Express Company, one of four national freight shipping conglomerates in existence at that time. Originally 23 stories (three floors were added in 1927), the building’s façade is made of limestone, with intricate terracotta ornamentation on the upper levels. Additionally, the building has a central courtyard, which means that each floor has a full six sides of light, as well as excellent cross-ventilation that allows for copious amounts of fresh air to enter. Cove’s director, Marc Rosenberg, noted that having the architectural, engineering, design, and brokerage partners on the team prior to closing on the building was instrumental to the success of the repositioning. “This truly allowed us to create a complete plan for redevelopment, one that we could start the second the deal closed. In fact, the redevelopment plan was undertaken during the underwriting phase,” he stated. Prior to the upgrades, the lobby featured vaulted ceilings, outdated designs, and chandeliers. One of MDALLP’s first design decisions was to remove the vaulted arches and open up the ceilings to the slab. The new design distinctly communicates transparency and community, which is exactly what the new owners wanted to convey. The property has always had a public arcade space within the property line. However, the arcade and the lobby had been separated by large column enclosures that restricted access into the building. In the interest of openness and transparency, the architects decided to match the plane of the lobby ceiling with that of the arcade, in order to extend the volume of the lobby into the arcade. 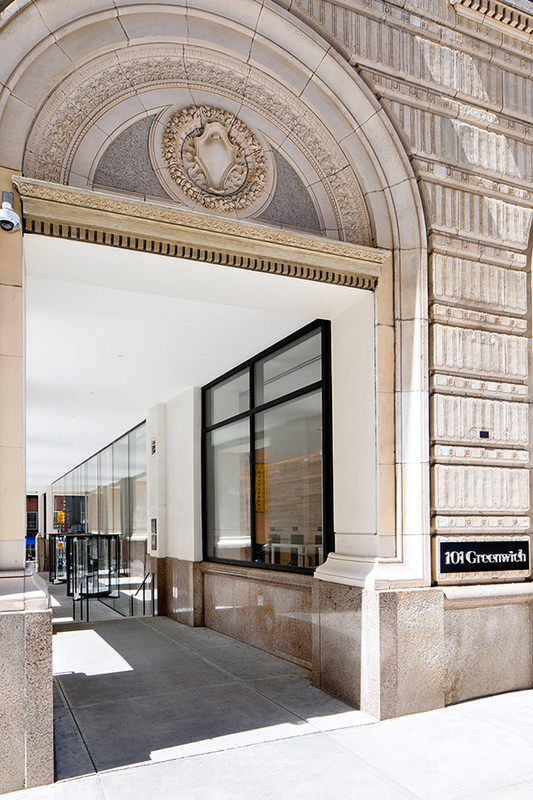 Now, with 101 Greenwich, the building’s guests, neighbors, and tenants can visit easily both the arcade and the new lobby lounge amenity. MDALLP’s David Park, the Job Captain on the project, said, “The renovation opened up the arcade through the use of a floor-to-ceiling glass wall, essentially extending the lobby to the outside. By day, light hits the 16-foot-high, renovated arcade. By night, passersby can look into the arcade, as the glass wall seems to disappear. People find it to be extremely attractive, so they enjoy walking by it.” The construction team installed a new ceiling and ceiling lights. The new, light-colored marble floors in the lobby create a continuous look to the arcade outside, with the same non-slip stone pavers used there, for visual continuity. 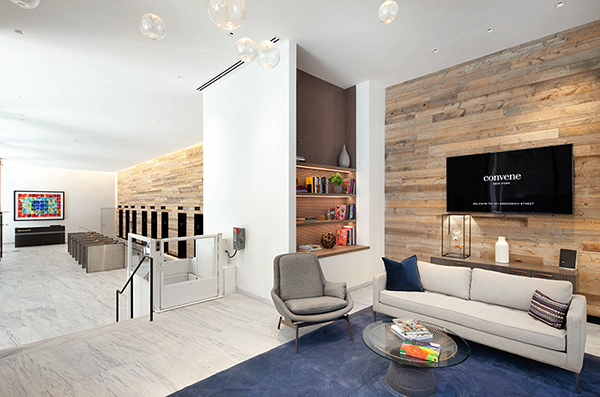 The redesigned lobby features a reclaimed-wood plank wall, which is grazed by linear LED cove lighting designed by zeroLux and manufactured by Ecosense Trov. The rough-hewn wood was used to illustrate the connection to the railroad cars and ties that United States Express used to transport shipments. Two other elements were incorporated into the new lobby, to tie back to the history of the building. The first was a medallion built into the floor by the reception desk that commemorates the company and states that the structure was completed in 1907. The second item consists of commemorative coins incorporated into a sign near the lounge. United States Express issued these coins in 1904 to mark the company’s 50th anniversary. All of the existing metal trim and finishes were replaced with black steel for a contemporary, industrial aesthetic. The new reception desk was designed with stone and metal finishes. One requirement was that it had to house all of the elevator and fire alarm equipment. In addition, it has a built-in address identity that is inset in the stone and backlit with LED lighting. Further, the entire lobby storefront was completely redesigned with new revolving doors and ADA-compliant access, using the same black steel metal finish as the trim noted above, and even exposing the adjacent columns and their rivet details. The existing entrance along Trinity Place was enclosed and recaptured to offer tenants a building amenity by creating a cozy lounge area equipped with a small library of books relating to New York City real estate and history as well as soft seating and Wi-Fi. Eddy Viteri, MDALLP’s construction administrator, said that this lounge area was styled in a mid-century modern design. “The lounge features a cluster of custom blown-glass pendants with custom metal and a silver leaf finish. These are highlighted by and reflect light from the ceiling fixtures above them,” he said. Thus, they seem to float at various heights over the seating area and cast an eye-catching soft glow and light reflections onto the ceiling. The striking glass-and-metal pendants are by Studio Bel Vetro. The design team specified new elevator cabs, with completely redesigned finishes. They feature glass panels with a mirror-backed acid-etch finish and minimal trim detailing that create a soft look with a depth to it. 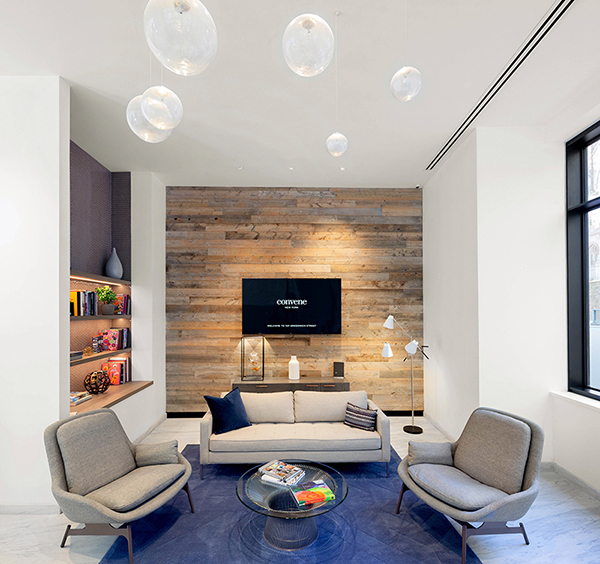 The reclaimed wood ceiling matches the wood used throughout the lobby as an accent wall and nod to the building’s past. New elevator flags were created for easy-to-see demarcation for the active elevators. The elevator system now features a dispatch system that assigns passengers their elevators in advance. Finally, they also upgraded and repaired exterior portions of the building restoring the architectural details of the façade by matching terracotta details which had been lost over the years. The culmination of this work was highlighted by the installing exterior lighting on the perimeter of the building, uplighting the façade, and defining its details to create a dramatic visual effect. One of the main challenges of the renovation was working within the 111-year old year old building. According to MDALLP’s Project Manager, Mark Vella, “There are always unforeseen technical conditions you uncover when working within a building this seasoned,” he said. “However, we did our due diligence before Cove acquired the property, so we knew the extent of the upgrades that would be needed,” he continued. In their initial analysis, for example, MDALLP saw an obvious need for MEP and technological upgrades, as well as a redesign of the public spaces. The construction team performed all of its work while the building remained occupied, and carefully coordinated with the tenants so as not to interrupt their operations. Though challenging, the success of the work was a true testament to the skill and planning of the entire team. As part of infrastructure upgrades, the construction team removed the decommissioned 48” diameter cast-iron coal flue. which ran through the building from the basement to the roof. As the boiler had been decommissioned decades earlier, COVE and MDALLP proposed removing the abandoned flue and slabbing over the recovered area, thus freeing an extraordinary 5,000 s/f throughout the building. The virgin brick surrounding the flue was preserved where possible, in order to retain a portion of the rich architectural history of the building. After the initial assessment, the team decided that it was crucial that the building infrastructure upgrades were to be done first. The construction team installed an entirely new HVAC system and consolidated the core facilities – such as the bathrooms – in the back of the floor plates, freeing the floors’ perimeters near the windows for the open-plan office areas. Perhaps the most important mechanical upgrade was the installation of the Daikin variable refrigerant flow (VRF) system on a newly erected steel platform in the courtyard. VRFs use refrigerant for both cooling and heating, eliminating the need for oversized, expensive, and maintenance-intensive chiller plants. Not only is VRF more energy-efficient, it meant the owners did not have to put the units on the roof and could eliminate a mechanical room within the building. Thus, even more square footage was recaptured and converted into revenue-generating tenant space. The building owners also wanted to give each tenant control over their space’s temperature. In fact, the systems upgrade included a separate metering and control system for each floor and each tenant. Thus, tenants do not rely on a central building system but, rather, have their own display so that they see only their company’s electrical use. This is another transparency advantage. Interestingly, MDALLP found that the building still functioned on the original DC power system, along with the original equipment and switches produced by the Thomas Edison Company – all in good condition. However, the construction team upgraded the electrical services to AC service, relegating the new switch gear to the second floor, as part of preparedness plan initiated by COVE to protect the building’s infrastructure during potential future natural disasters. Similarly, a 750kw diesel backup generator was installed on the elevated mezzanine level to provide power to critical building systems during an outage as well as being able to provide spare capacity to tenants if they wish to purchase power. The mezzanine also houses telecommunications and data infrastructure in a Meet-Me room providing a termination point for the proposed network providers and building systems. The project has achieved Platinum-level Wired Certification from WiredScore, as the team had the foresight to install redundant telecommunications risers throughout the building. Other system upgrades included the plumbing, along with new water lines. Because the team relocated the electrical systems, the basement was freed to eventually become an additional income-generating area. In fact, the building features a sizeable sub-basement with extremely high slab-to-ceiling heights of 40 feet. The building upgrades also included the creation of new bathrooms on each floor. “We used a simple, contemporary aesthetic,” said MDALLP’s designer, Mariana Panova. “We combined clean-looking white subway tiles on three walls of each bathroom, and clad the fourth wall in reclaimed wooden planks, as an accent,” she said. The look was finished off by specifying custom, concrete-trough sinks. The sinks were made by CustomCreteWerks, Inc. by molding the concrete countertop in one, seamless piece, which are a visually stunning focal point to the bathrooms.